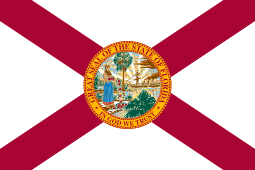 The Flag of Florida is a white flag with the Seal of Florida centered on it. Behind the Seal, it has a red saltire, which resembles the Spanish Cross of Burgundy flag used in Florida since the early 1500s. The current flag was adopted in 1900, however the State Seal in the center of the flag was updated in 1985 to reflect the proper historical dress of a Seminole maiden, in the previous seal she was dressed in buckskin with a feathered headband. This page was last changed on 4 January 2015, at 18:30.